We are quite lucky that we have friends who put up with our crazy bike love. 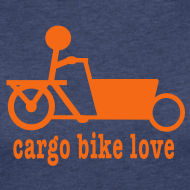 More than that even, our friends often are fully supportive of our bike habit. Case in point-- this weekend, we had good friends from Maine visit. When they asked what they should bring, we listed bike helmets and bathing suits as the two most essential items to pack. We never want to pressure folks into riding with us, but we do want to give them the opportunity to see the city the way we do if they wish. At any point, if we had a visitor say that they were uncomfortable cycling here in our city, we would make other transportation decisions. However, the E-J crew was game, leaving their car parked in our driveway and getting around New Haven on two wheels. All-in-all, we had five kids, four adults, four bikes: three cargo and one English roadster (it turned out to be great thing that we haven't yet sold the bakfiets). On Friday night, J gamely went with me to pick up pizza here, braving the nutty traffic as parents were dropping off their kids off at Yale this weekend. J rode P's 1968 Rudge while I took the bakfiets, perfect for carrying multiple pies. 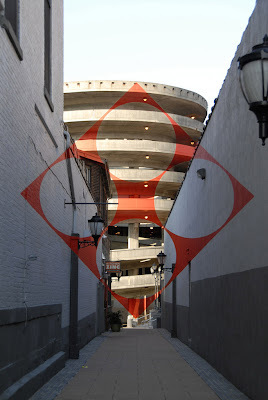 Even though downtown was extremely crowded, we could zip right up into Kitchen Zinc's alley, getting a great view of the cool perspective installation called Square with Four Circles. 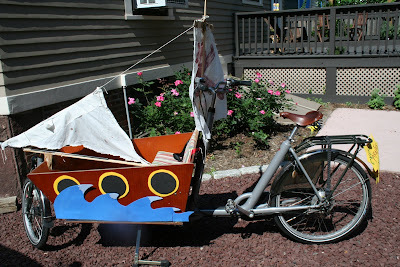 Three of the restaurant's staff came out to check out our box bike, admiring it with much praise. As we turned our bikes around to head back home, a wedding party was just coming up the stairs to pose on the side of the Shubert Theater. It was just a great moment watching the purple-clad bridesmaids and decked-out bride, and it made me be glad, yet again, to live here. The next morning, we had a school picnic to attend. This time we needed to get the whole crew to the other side of town, with a stop to pick up coffee and supplies. B was willing to ride the Xtracycle with one kid, I took the bakfiets with two, P on the Yuba with the other two. We got to see how our Yuba handled with a much bigger passenger (a tall 8th grader!) than we are used to riding, It was an unqualified success although P's thighs got an extra good workout. When we reached Willoughby's, we loaded the big box container of coffee into the bakfiets. I was glad that I had over a year of experience riding the twins in the box because I was able to handle the weight of a four-year-old, a ten-year-old, and coffee for 50 people. And then, we cycled off to the park, pleased that we arrived by bike with all of our guests and supplies without using any gas. R and A, our two younger visitors, remarked on what a friendly city New Haven is. I must say that being out on bikes definitely helped cement this impression for as we rode, many along the street called out and greeted us. We were happy to wave and return their greetings. And for all the times we come across impatient or irate drivers unhappy about sharing the road, these other interactions-- the positive words and friendly greetings-- make us feel like we really belong to a great community. And I am glad our friends agreed. Back at home; Smiles all around! With a nod of thanks to all the other pirate-ship-decorated box bikes out there (here, here, here), we finally fulfilled F's long-time wish and turned our box bike into a pirate ship for New Haven's Summer Cycling Celebration. P rigged an awesome mast that was well-placed so one could still see while riding. I wish I had gotten better photos of the bike but I bet there are a number of pictures of it floating out there since people stopped us a bunch of times to take pictures. 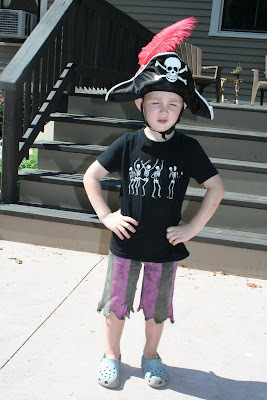 F, who constantly likes to dress like a pirate, happily stayed in character. We were able to put his pirate hat right over his helmet and taped on a red feather for an extra touch. The pirate hat covering has been abandoned but he is still wearing his red feather on his helmet, which is quite cute. 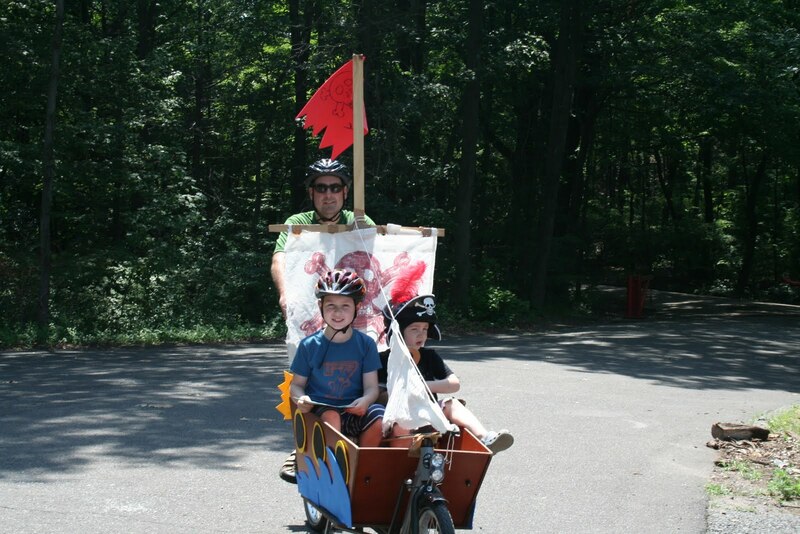 The Summer Cycling Celebration was sponsored by the city's local Street Smarts campaign. 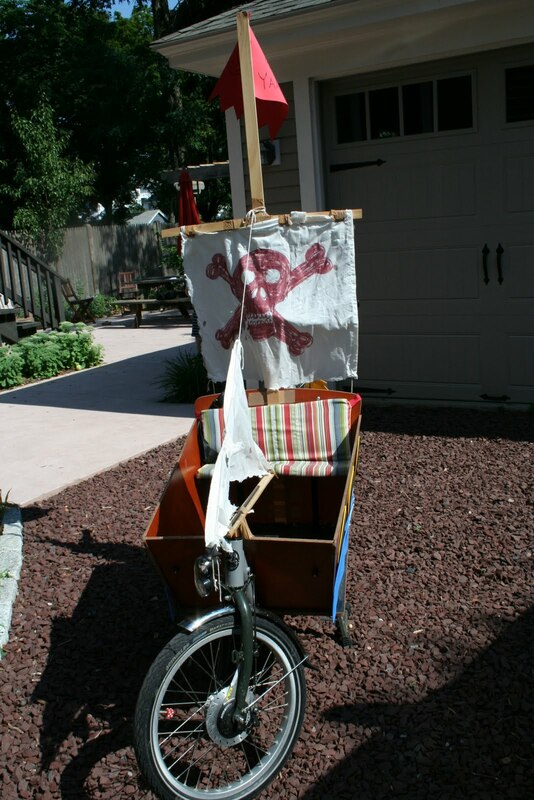 In keeping with this, we attached a sign to back rack of the bakfiets that said, "Even Pirates Need Safe Streets." 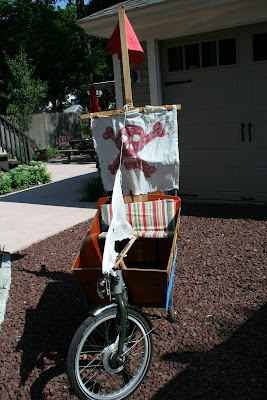 The weekend after the Cycling Celebration, I was riding F to a birthday party in our still-decorated pirate ship when I heard the sound of pedaling and puffing over my left shoulder. A voice suddenly said, "Oh, even pirates need safe streets, huh?" Glancing to my left at the fellow bike rider now riding parallel, I replied, "Oh, that's right, Mr. Mayor." So Mayor DeStefano does ride even when not courting votes. We just got back from an excellent week at the Jersey Shore. When I posted "JERSEY SHORE" to my Facebook status, I was quick to clarify that I wasn't talking about that Jersey Shore but the actual beach, ocean, and three boys with boogie boards. Funny enough, just hours after I'd updated my status, my husband went to buy dinner fixin's at the local market only to be surprised at how swamped it was for a Sunday evening. It turns out that yes, that Jersey Shore had intruded a bit upon our vacation as two of the cast members were also 'shopping' at that local market, accompanied by camerafolks. Anyhoo, we had discussed bringing our bikes with us on vacation. The beach generally is a great place to have a bike, but after realizing that it would take a whole lot of advanced planning to get our bikes to the beach (especially our cargo bikes), advanced planning that we just didn't have in us, the bikes stayed locked up in the garage at home. I couldn't help but see some irony in this decision as we passed car upon car on the NJ Parkway laden with brimming bike racks. Here we ride bikes in our everyday life, yet were bike-free on vacation. I couldn't help but wonder if most of the biking vacationers are the opposite: bike riding on vacation but never in 'normal' life. Who knows? Happily, our rental was well-located. We could walk to the beach, market, ice cream shop, and my sister's so we didn't need to take the car out daily. It was great fun to see all the colorful bikes out and about in our vacation town. Beach cruisers everywhere. I especially love the ones rigged with racks to carry surfboards and couldn't help but think that someone selling longtail cargo bikes at the Shore would have a real market. However, I didn't see an Xtracycle or Yuba among the crowd. I did love the bright blue tricycle adorned with front and back baskets that a local clearly used for grocery fetching. I liked that there was a huge range of bike riders-- people of all ages, pedaling away, enjoying the sun and salt air. I've long recognized that every day I ride my bike is like riding in a convertible, no need to put the top down. One thing that struck me is the total lack of bike helmets among the beach bike riding crowd. I've read bike blogs long enough to know that the mention of helmets can set off a firestorm of pro vs. con comment debate. Thankfully, I don't have enough blog readers to set off such a firestorm and truthfully, I am not interested in doing so. Ultimately, wearing a helmet or not is your business. As a parent, I feel it is important that I wear a bike helmet. My kids are required by law to do so, and I personally would have a hard time with the whole, "Do as I say, not as I do" thing around bike helmets, married with the fact that I have a brother-in-law who is still alive after being hit by a van while he was out on a long ride. He spent many months in the hospital and now sports a multi-inch scar on his head, but his bike helmet saved his life (and thanks, too, that the next car passing was filled with doctors). Now if I lived in a European city where bike riding was the norm and bike helmets were not, I am not sure if I would wear a helmet. But I don't live in a European city with a strong bike infrastructure or culture. I live in a city where there is minimal bike infrastructure, where drivers still aren't terribly accustomed to sharing the road with bike riders, and where a number of cyclists pay little attention to road rules. It isn't a great combination. So always a helmet. Yet at the Jersey Shore, while bikes were abundant, helmets were a rare sight. New Jersey state law requires any rider under 17 years to wear a helmet, but this was clearly not enforced in the beach towns we visited. There were a few times we saw kids on bikes with helmets but they were not strapped. My husband speculated that maybe beach bike culture predates the whole bike-helmet-safety thing. It wasn't as if the streets were terribly bike friendly, many riders on the shoulders of two-lane highways that run north and south in town that see cars whizzing along between spaced traffic signals, with nary a true bike lane. A high school friend who lives year-round in one of these towns said that at the end of this school year, a letter from the local police was sent home saying it would enforce NJ's bike helmet law, but she sees no sign that this is actually happening. I can't help but wonder if the 'different rules for vacation' thinking is at work with the no helmets on bikes at the beach. You know-- folks traveling engage in activities they would never thinking of doing while at home. I won't mention examples like *cough* *cough* riding helmet-less and in flip-flops on a motorcycle across a certain small island in Thailand to get to town for fresh watermelon shakes or sitting atop a sack of rice on top of an overly-crowded public bus as it speeds its way on a narrow, windy road in Laos. So, I'll leave that just as an observation with no criticism or conclusion. 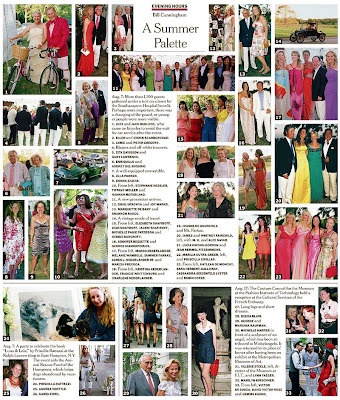 And yes, I DID so love in today's NYTimes the photo in the left-hand corner the page of rich party-goers happenings, captioned "JUDY and JACK HADLOCK, who came on bicycles to avoid the wait for car service after the event." No, they aren't wearing bike helmets but damn, you've gotta love Mr. Hadlock's frilly shirt, bow tie, shorts, and long socks combo, and of course, ultimately the fact that he and his wife traveled to the shindig by bike. Brilliant. Play Storm Trooper, of course, with water telescope and rocket-shaped bubbles container. We ARE supposed to encourage imaginative play, aren't we? ** I must say that F, our nearly five-year-old, has never seen any of the Star Wars movies yet (nor have our older fellows) yet he seems to be able to speak about it with some authority that I find quite unnerving.